Until recently, establishing an offshore trust was a difficult project — expensive, time-consuming and somewhat mysterious. Yet many of the wealthiest investors accepted the difficulties… because they valued the enormous advantages for asset protection, privacy and tax-planning that only a lawful offshore trust can provide. You’ll be happy to learn that establishing an offshore trust has become much easier. A lawful offshore trust is still the most powerful of all financial planning strategies. It still offers brick-wall protection from predatory lawsuits. And it still opens the door to legitimate tax-saving opportunities most Americans never hear about. But now Passport Financial has made offshore trust formation easy, understandable and surprisingly inexpensive. Path #1 — Talk To Your Lawyer. Any trust calls for competent legal planning, so you might start with your own lawyer. Most likely, he won’t have the specialized skills required for setting up an offshore (or international) trust. But he probably can refer you to an attorney who does. The legal specialist will get the job done. He’ll prepare an offshore trust instrument for you. And he’ll refer you to a qualified offshore trustee. But his help will be expensive — $20,000 to $50,000 just to set up the trust. And it will be a slow process, taking perhaps three months or longer. Even after that effort and expense, something important may be missing — your clear understanding of how the trust works. When the legal specialist drafts the trust instrument, he’ll focus on including all the right provisions. But he’ll be writing with other lawyers in mind — not you. He won’t be concerned about preparing a document you and your heirs can read and understand. He’ll try to answer all the questions you ask, of course. But being a good lawyer doesn’t mean being a good educator. Path #2 — Start With A Trustee. You can search for a qualified offshore bank or trust company on your own. The institution you eventually select to administer your trust probably will have a standard trust instrument that you can use, as is, without paying high legal fees. This may seem to be a quick and inexpensive path to offshore trust formation, but it is hazardous. The trust instrument may not be written with any consideration for U.S. tax rules, and so it may lead you to unwelcome tax results. And the document may not be written with an understanding of how to prevent a lawsuit winner in the U.S. from bringing pressure on you to undo your offshore trust. Path #3 — Use The Passport Financial International Trust Kit. The Kit was prepared specifically for safety-minded U.S. investors who want to understand, before they act, exactly how a lawful offshore trust works to protect their wealth. It was prepared with the active participation of U.S. tax and litigation specialists, whose job is to open up tax-saving opportunities and to close the door on predatory lawsuits. And it was designed to make organizing an offshore trust convenient and inexpensive. With the Passport Financial International Trust Kit, you get best of all possible arrangements. The Kit is clear, complete and easy to use. It includes a trust instrument that has been reviewed independently by hundreds of attorneys. And your own lawyer can review the trust instrument expressly for you in just an hour or two. The Kit also introduces you to a stable offshore jurisdiction with the right laws and to a respected trust company that already is administering hundreds of trusts just like yours. With the Kit, you’ll understand every aspect of using a properly structured trust to repel predatory lawsuits and to gain valuable tax-saving opportunities that stay-at-home investors miss out on. Materials that have been reviewed by hundreds of independent American law firms. Passport Financial’s Kit is the practical, carefully engineered path from the exposure and worry of keeping all your assets in the U.S. to the safety and peace of mind of a lawful, properly structured international trust. 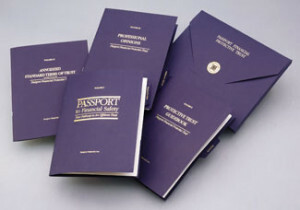 Passport Financial's International Trust Kit is the least expensive pathway to a lawful offshore trust.